Held at the T.A.T.T.E Building Conference Centre last Saturday night, the launch was attended by church Ministers, guests and members of different churches who celebrated the achievement of a milestone. 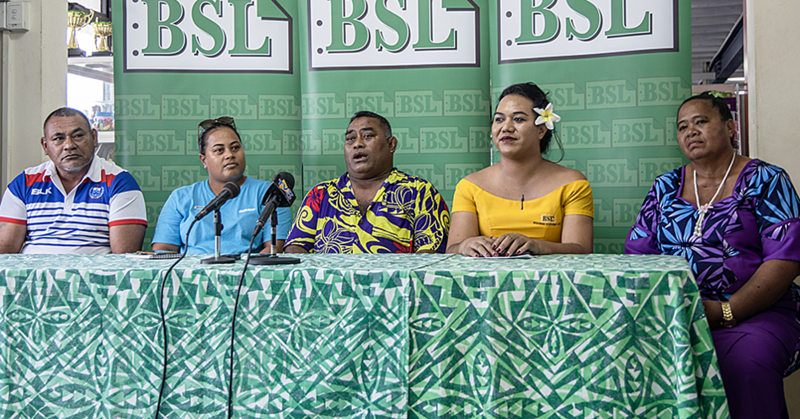 Y.F.C Director, Manasa Aloali’i, said the title of the album speaks about Jesus Christ's unchanging nature. “The first gospel song; which is also the name of this CD Album, if you listen to it it's called "O Iesu e Tumau", it's from the book of Hebrews 13:8, and it says that Jesus Christ is the same yesterday and today and forever,” Director Manasa said. “And with that, it means that it’s really important that our youth must walk towards Jesus. “No matter what kind of life we go through or how hard it gets, we always come back to Jesus and he never once turned us away. He added that he was inspired to work on this album when he noticed a lot of potential in the youth members. “You know, Y.F.C. is not a church but a community for our youth and most of the times we look at ways to develop our youth and create a way for them to stay away from bad influences and use their talents to praise God. “So when I noticed one talented soul and also the leader of the band, Samuelu; this young man had never attended any music schools in his life, he was self taught and he has so much knowledge with computers. I thought to myself that there's so much potential in him but he just needs someone to help and guide him along and that's where the decision to create this CD came up. Director Manasa also spoke about the challenges that he’s had to deal with when he was working in bringing different members of the Freedom Band together to create this album. “As you know, the youth members in this band are all of different religions such as E.F.K.S, Catholic, Peace Chapel, A.O.G., Good Samaritan, Full Gospel and Voice of Christ; so those are all youth members that have joined together to form this band or team. Another major challenge that they had to go through was having no funds to start this album as they are a non-profitable organization but nothing was impossible to God. “It's not easy to do this without any money and I’ve spent a lot of time, thinking on how we were going to do this job. “We started with zero budgets but Y.F.C. lives on faith and support from their own partnerships; these partners give into the work of the Lord. “So we did fundraising; selling BBQ and from that, we’ve raised $1,000. “We used that money to buy something that's called a shield from America and we downloaded a program for instrumental sounds and that's all we had at our office. “I've never done any recording before, all I had was my passion for sounds because I have a background in sound system and with these kids potential, I believed we could do it ourselves. “We were all learning and one thing I've learned from this is; unity. “We've also learned that one style cannot work because they were from different churches so we had to find a common ground. “We started from zero budgets but we've managed to finish the whole recording. For first timers, we did well! Director finished with an advice for everyone “What I'm trying to say in all of this; is that the youth is very important to God because this is where the future of our work lies within. “That's why as of this evening, we not only thank God but also those who have been inspired to do Gods work continuously. 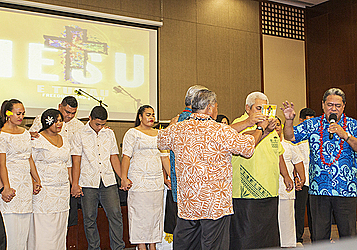 The album consists of seven Gospel Songs in Samoan and English.